The findings will be presented by Dr Sharon Wright and Dr Alasdair Stewart, University of Glasgow, drawing upon three waves of repeat interviews with the project’s Universal Credit sample and Scotland sample, which also included: jobseekers, disabled people, migrants, lone parents, homeless people, offenders and those subject to anti-social behaviour interventions and Family Intervention Projects. This comes at an important time for Scotland as the DWP continues to extend and intensify conditionality in the reserved parts of the British social security system operating in Scotland, whilst in contrast, the Scottish Government has begun to use its own newly devolved powers to introduce social security legislation based on the principles of dignity, fairness and respect. 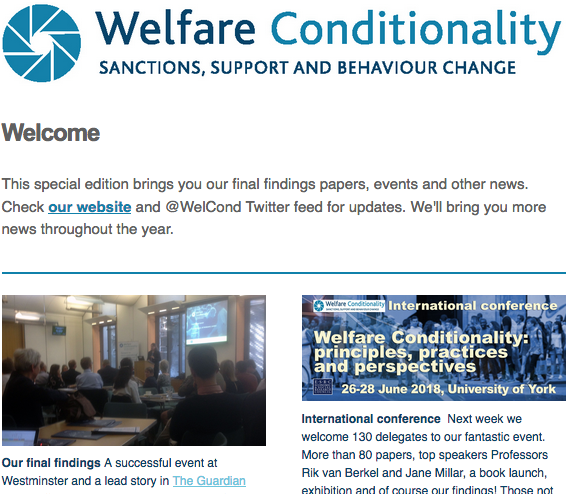 This event aims to provide a unique opportunity to discuss the welfare conditionality project’s findings within this context, and assess how they can be used by policymakers and frontline workers across Scotland. Responses will be heard from commentators and stakeholders, and attendees will be encouraged to take part in small group discussions and provide their own responses.